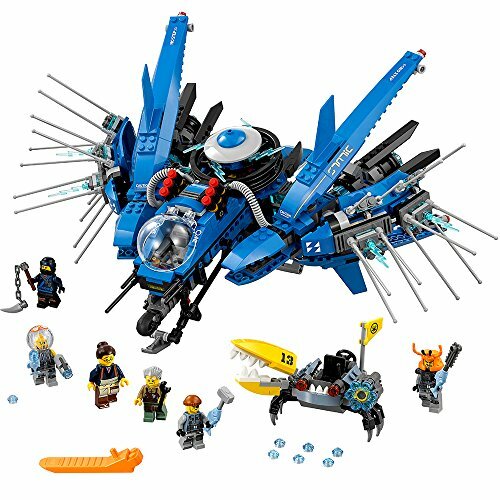 Save Ed and Edna from the shark army's crab with Jay's Lightning Jet in this thrilling THE LEGO NINJAGO MOVIE set. The jet has a handle for easy pick-up-and-play and maximum swoosh ability, plus an opening cockpit, spring-loaded shooter and trigger-activated rotating electro-disc. The crab features posable legs, a snapping pincer and 6-stud rapid shooter, and the set also includes 6 minifigures with assorted weapons to dial up the role-play conflict. 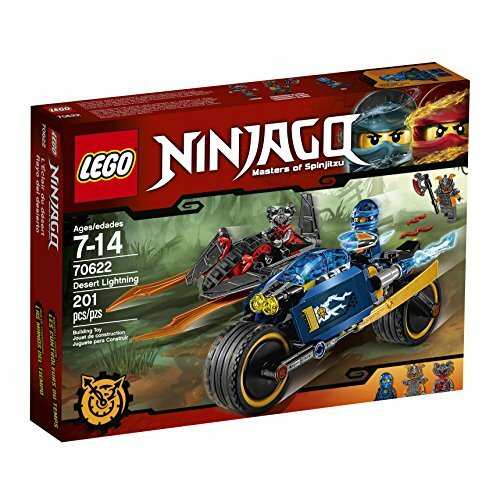 Spin into high-speed action with LEGO NINJAGO 70660 Spinjitzu Jay. 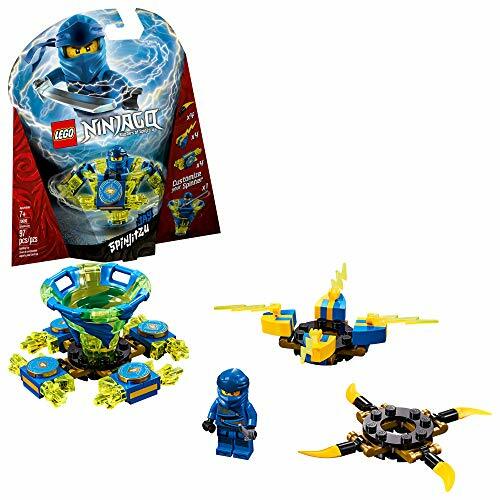 This fun ninja toy features Jay’s Spinjitzu Tornado of Lightning spinner with a new-for-January-2019 LEGO NINJAGO spinner element and 3 attachments for attack, defense and speed modes. Experiment with different techniques, create your own challenges and compete against your friends—the possibilities are endless. This creative toy includes a LEGO NINJAGO Jay minifigure with a katana, plus 3 buildable display racks for attachment weapons and elements. 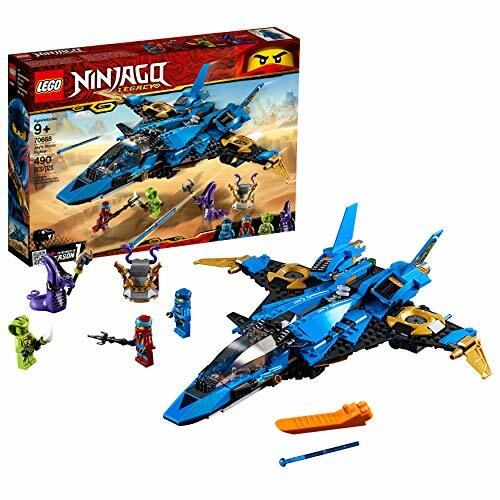 Join ninja warrior Nya’s battle against the Serpentine snakes and reclaim Jay’s Nunchucks of Lightning with LEGO NINJAGO Legacy 70668 Jay’s Storm Fighter toy plane. This shooting fighter jet features an opening minifigure cockpit, spring-loaded shooters, foldout wings and blades. This action-packed ninja playset includes a collectible Golden Weapon—The Nunchucks of Lightning—with a buildable Serpentine stand, plus 4 NINJAGO toy action figures with weapons to role-play and reimagine classic action from the NINJAGO Masters of Spinjitzu TV show. 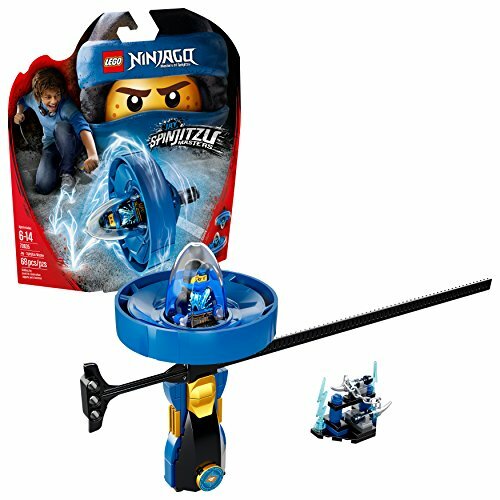 Test your Spinjitzu skills to the max with the LEGO NINJAGO 70635 Jay – Spinjitzu Master spinner toy, featuring a Spinjitzu spinner with buildable LEGO brick handle, spinner element with minifigure capsule, and a rip cord. Learn different minifigure-spinning, rolling and jumping techniques and tougher skills using the included weapon rack as an obstacle. Compete against your friends and use your environment to create countless fun Spinjitzu challenges. This battling toy includes a Lightning Ninja Jay minifigure with 2 shurikens to hold in the spinner. Launch into aerial action with the LEGO NINJAGO 70646 Jay - Dragon Master flyer, featuring a buildable LEGO brick handle, minifigure capsule, blade element, dragon wings and rip cord. The best toy for performing solo tricks, you can also compete against friends, and use your environment to create countless thrilling ninja challenges. 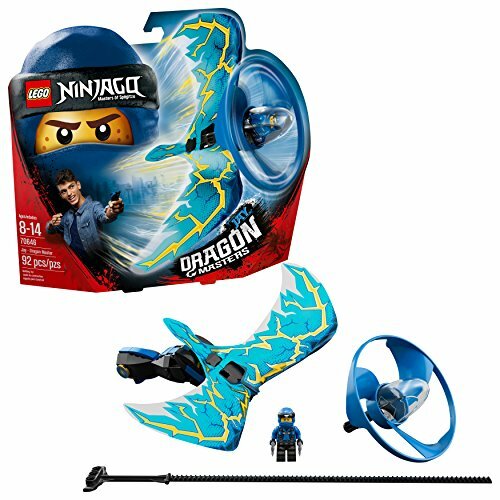 This LEGO NINJAGO spinning toy includes a Jay minifigure. Beat commander blunck's vermillion racer to claim the slow motion time blade with jay's desert lightning bike, featuring stud-shooting headlight-style elements, foldout lightning bolt booster elements and big wheels. This fun toy includes three mini figures. Join Ninja Jay in battle against the shark army and protect Takuma’s boat from Flying Jelly Sub attacks, in this action-packed THE LEGO® NINJAGO® MOVIE™ set. The sub features an opening minifigure cockpit, rotating legs, 2 flick missiles and swinging ‘toxic’ tentacles. Also includes a boat, plus 4 minifigures with assorted weapons to add to the battle role-play options. 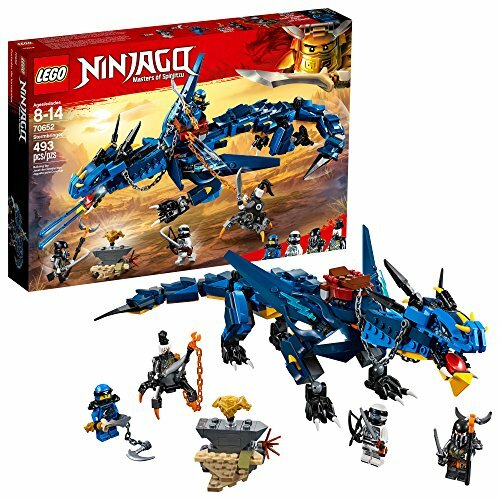 Fly LEGO NINJAGO 70652 Stormbringer the Lightning Dragon with Jay and battle against Daddy No Legs and Muzzle to claim the Dragon Armor. Fire spring-loaded ‘lightning bolt’ shooters from the mouth of this highly posable dragon, which also features a removable minifigure saddle, swiping tail function and attachment points for the Dragon Hunter Daddy No Legs to hook the dragon. 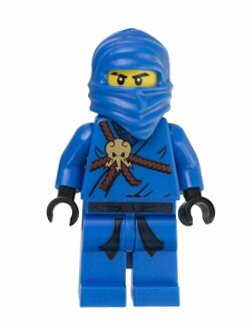 This ninja toy also includes a pedestal to hold the collectible Dragon Chestplate element, plus 4 LEGO NINJAGO minifigures with assorted weapons—including the collectible Dragonbone Blade—to boost the role-play battles. Bring exciting new play possibilities to LEGO® NINJAGO® sets with LEGO Minifigures—THE LEGO NINJAGO MOVIE™ series, featuring Kai Kendo, Spinjitzu Training Nya, Lloyd, Jay Walker, Cole, Zane, Lloyd Garmadon, Master Wu, Sushi Chef, N-POP Girl, GPL Tech, Shark Army Octopus, Shark Army Great White, Shark Army General #1, Shark Army Angler, Garmadon, Volcano Garmadon, Flashback Garmadon, Misako and Gong & Guitar Rocker. Each minifigure comes in a sealed ‘mystery’ bag, together with one or more accessories, plus a display plate and a collector’s leaflet.